Description: The eagerly anticipated companion to the #1 international bestseller Eat. Nourish. Glow., filled with fabulous recipes for making a whole-foods based lifestyle easy and delicious. In her international bestseller Eat. Nourish. Glow., celebrity nutritionist Amelia Freer introduced her whole-foods philosophy and provided ten easy steps to help you look younger, lose weight, and feel great. In Cook. Nourish. Glow. she builds on the handful of recipes in her previous book, offering 100 wholesome dishes and meals illustrated with beautiful photos and step-by-step visuals. Amelia’s simple but delicious recipes and tips make living a healthy lifestyle effortless. 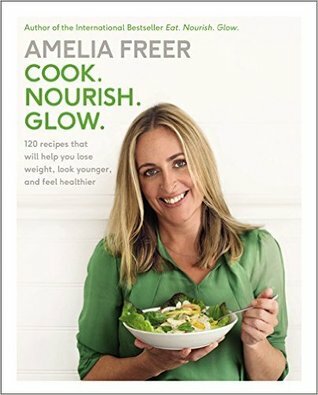 From preparing and using wholesome pantry staples to whipping together on the go meals and snacks; cooking gut-friendly foods to baking a few “naughty” treats, Amelia equips you with the skills and knowledge you need to cook with confidence and improve your health with every bite. Excellent practical advice about eating healthier and getting away from pre packaged meals. Although recipes easy to read, they are not set up well in terms of prep work.